Chicken Pasta in White Wine Sauce - What's In The Pan? With holidays over and busy nights ahead of us, I love new quick and easy dinner ideas! I love pesto because it’s so flavorful and delicious. And I can use it to make a simple meal that is flavor packed in no time. There’s nothing better than having a restaurant quality pasta dish on the table in minutes! 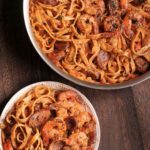 My family loves a good creamy pasta dish any night of the week! This pasta dish is spectacular with White Wine Cream Sauce! You will use Parmesan cheese as well. 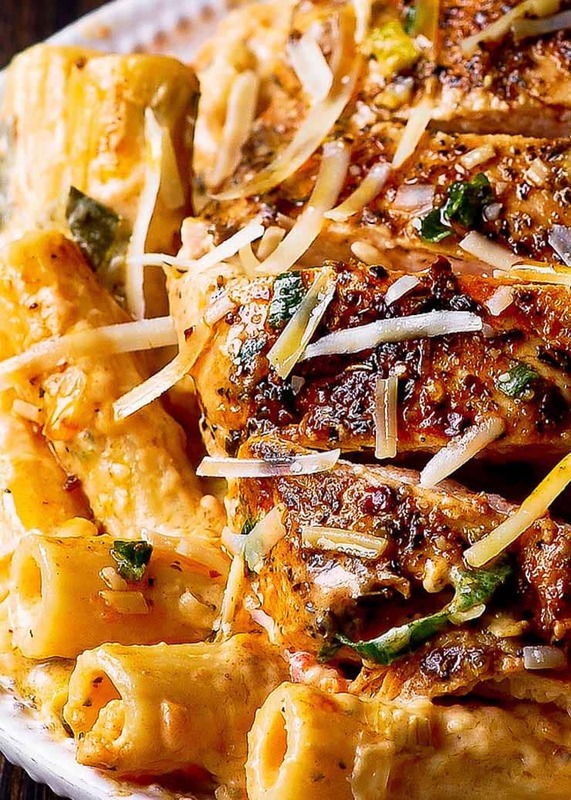 I promise you that this luxurious chicken pasta recipe will blow your mind and taste buds. It’s packed with flavor thanks to Chardonnay and truly a restaurant quality pasta dish. It’s not only amazingly delicious but so easy to make. Ideal for a quick weeknight dinner or serving to company. Classically savory and flavorful! Paper towel dry the chicken and generously season it. You will need Italian seasoning, paprika, salt, pepper, and a pinch of red pepper flakes. Heat olive oil in a large deep skillet. Do remember to brown the chicken very well. It will add so much to the flavor of the overall meal. Here a link to my post on how to pan-sear chicken to perfection. It explains in detail what chicken to choose, what tools to use, etc. Now add chicken breasts to the pan. You will cook them on medium high heat for about 4 minutes on each side until nicely browned. For a total of 8-10 minutes. Check if chicken is still pink in the center. If it’s not done yet, reduce heat to medium. Cover with a lid and cook covered for 4-5 additional minutes until no longer pink. You will then remove chicken from the skillet. First things first, melt butter in the hot skillet. Then add diced red onion chopped scallions. You will cook them on medium high until onions and scallions are softened. About 4 minutes. Now add sliced garlic cloves and cook for additional 2 minutes. You will then add diced tomatoes and reduce heat to medium. To thicken the sauce, you will need to addd flour to pan. Stir to combine with a wooden spoon. Next you will add Chardonnay. Cook wine on medium high for 2-3 minutes. Now add heavy cream and chicken stock. Reduce heat and simmer for 3 minutes. Once simmering is over, turn off heat and add shredded Parmesan cheese. Whisk until you have a smooth mixture. Next add Italian Seasoning, salt, and paprika. Mix well. At this point taste the sauce and add more seasoning if desired. Lastly, add cooked pasta to the skillet with the sauce. Mix it into the sauce with a wooden spoon. You will then cover the pan with a lid and keep on low heat. 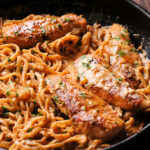 While pasta is absorbing the sauce, slice cooked chicken breasts. Almost there! Next add sliced chicken to the pan and cover with a lid to reheat them. Only for 2-3 minutes. 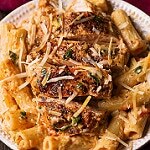 You can serve sliced chicken either mixed in with pasta or on top of pasta. And don’t forget to sprinkle with Parmesan cheese! I like to do that right on the plate. Follow me on PINTEREST and FACEBOOK to get more recipe ideas and videos! 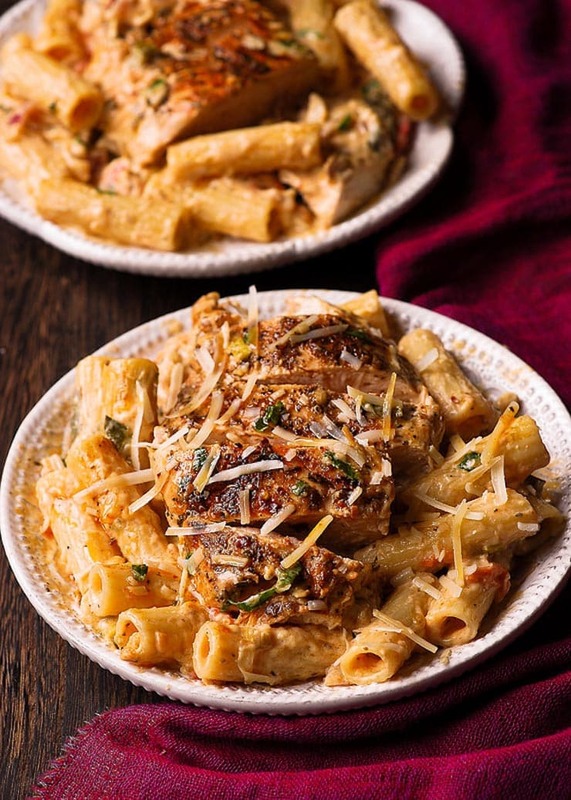 Rich and savory pasta dish bursting with garlic and herb flavors! COOKING PASTA: Start boiling water to cook pasta al dente (not too soft – we will add it to the sauce later where it will have a chance to soften up) in salty water. Drain, but do not rinse. SEARING CHICKEN: Paper towel dry the chicken and generously season with Italian seasoning, salt, pepper and a pinch of red pepper flakes. Heat 1 tbsp olive oil in a large deep skillet. Add chicken breasts and cook on medium high heat for a total of 4 minutes on each side until nicely browned for a total of 8 minutes. If it’s not done yet, reduce heat to medium, cover with a lid and cook covered for 4-5 additional minutes until no longer pink in the center. 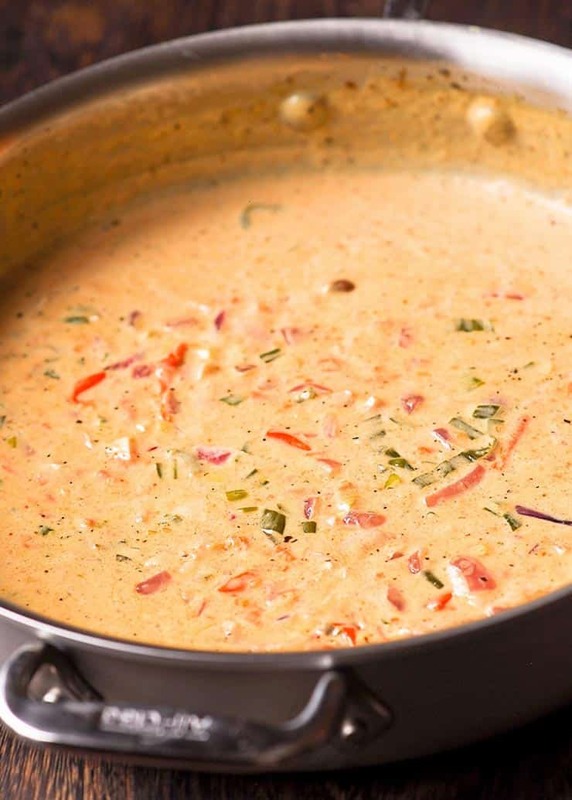 Make sure that all liquid, if any, is removed after cooking the chicken (depends on the chicken you use), otherwise the dish will be too watery. Remove chicken from the skillet. 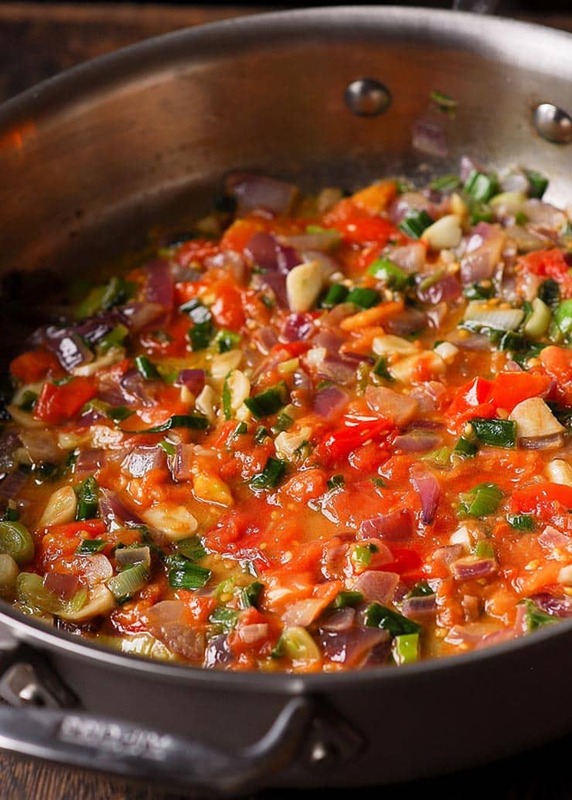 MAKING WINE SAUCE: Melt butter in the hot stainless steel skillet and add red onion and chopped scallions. Cook on medium high until onions and scallions are softened for a total of 4 minutes. Add sliced garlic cloves and cook for additional 2 minutes. Now add diced tomatoes, cook only for a couple of minutes and reduce heat to medium. Add 1 tablespoon flour to pan and stir to combine with a wooden spoon. Add wine and cook on medium high for 2-3 minutes. Add heavy cream and chicken stock, reduce heat and simmer for 3 minutes. 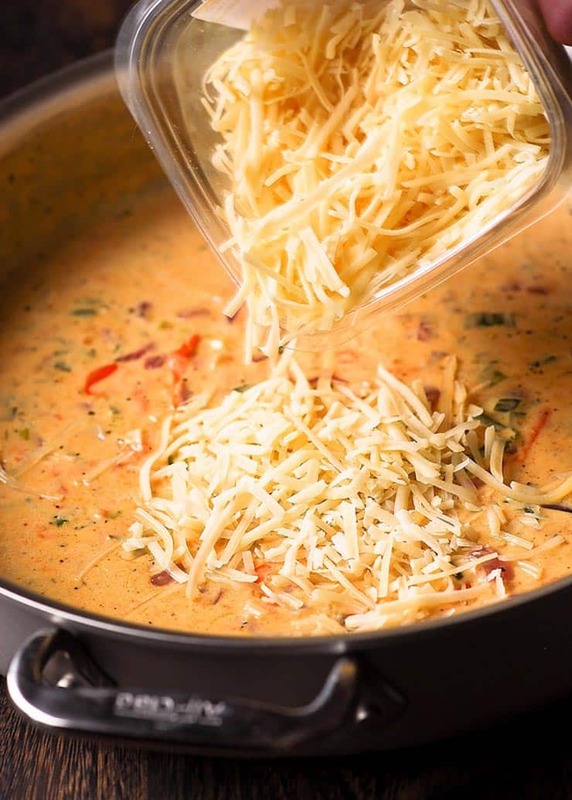 Turn off heat, add shredded Parmesan cheese and whisk until you have a smooth mixture. Add Italian Seasoning, salt, and paprika. Mix well. Taste the sauce and add more seasoning if desired. PUTTING THE DISH TOGETHER: Add cooked pasta to the skillet with the sauce and mix it into the sauce with a wooden spoon. While pasta is absorbing the sauce, slice cooked chicken breasts. Add sliced chicken to the pan and cover with a lid to reheat them. You can serve sliced chicken either mixed in with pasta or on top of pasta and don’t forget to sprinkle with Parmesan cheese. This was the best pasta dish I have ever made – Thank you! Thank you Jill. Your review made my day! Can I substitute canned diced tomatoes in lieu of fresh tomatoes? Yes, you can use 3/4 cup of canned diced tomatoes instead. I made this recipe Sunday and today, this is awesome. I used sweet cherry tomatoes, it added a slightly sweet undertone to the sauce. Even my picky son liked it, he doesn’t like onions in his food and by the time he’s done picking them out, he only has half of his portion on his plate, but this time he ate every last drop of this dish. Thank you, I’ve added it to the guest list. I’m so glad you enjoyed it and that your son loved it too. Thank you for coming back and letting me know! Can this recipe be made in advance and then reheated for a dinner party? I hate to be in the kitchen cooking when I have guests. Yes, it will taste great if made ahead. 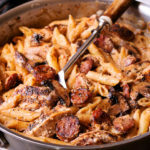 I had readers make this sauce with my other chicken pasta recipes and comment that it tasted better the next day. It was AMAZING. Really delicious thank you. Please do more using wine. Glad you found it delicious and thank you for your review! 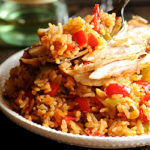 I keep coming back to this recipe because it is just so delicious and easy enough for weeknights. Such an easy recipe! Loved how creamy and the sauce was with beautiful wine flavor! Thank you Vera – glad you liked it. I just made it and it smells amazing in the kitchen. Cannot wait to try it! Yes, the smell is amazing!